If you love espresso as much as I do then you may be planning to buy a new espresso machine. If so, and you are looking for some suggestions and recommendations, I can help. I have reviewed hundreds of espresso machines and I will share as much information as possible about what I think are the finest espresso machines available in each category, and at several price points. In addition, I will point you in the direction of the best values from the most reliable and trustworthy online retailers. BREW LIKE A PRO Whatever your preference - single or double espresso, cappuccino or latte - the machine brews authentic barista-quality beverages just like you enjoy at your favorite coffeehouse. 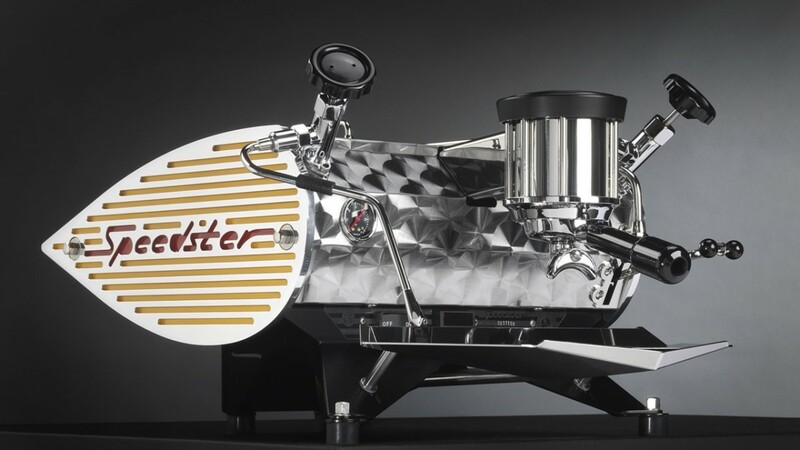 A steam-driven espresso machine – These don’t really make true espresso. More like strong coffee. But they are the most affordable priced between $40 and $75. Although they are a little more expensive I would recommend choosing a semi-automatic espresso machine or super automatic espresso machine. If you know the difference between a real shot of espresso and a strong cup of coffee you will not be satisfied with a steam driven espresso machine. If you’d like to learn more about the different types of espresso machines, you can read more here. Best Steam-Driven Espresso Machine – The cheapest alternative to real espresso. Just below $50! I would say that the Kalorik EXP25022 is the best steam-driven coffee maker in its category and price range. 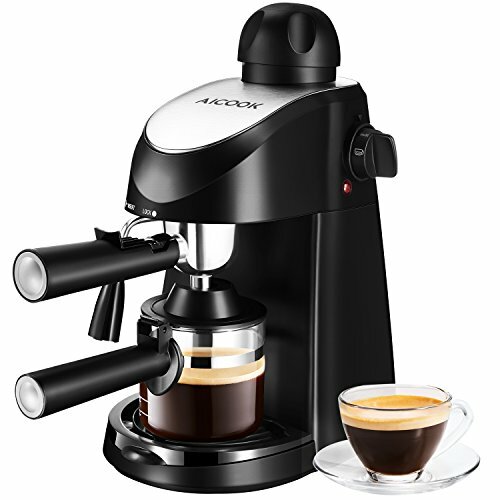 Although labeled as an “espresso machine” I am personally reluctant to review it as a machine that actually makes espresso, although it does look like, and operates somewhat like, a small espresso machine. I want to point out to you, as a consumer who may desire to purchase your first espresso machine, that this machine will not produce an espresso shot that comes anywhere close in quality and taste to what an authentic espresso machine will produce. The reason for this is that this machine is steam-driven vs. being pump-driven. Let me back up a bit. A great espresso is the result of forcing hot water, under pressure, over finely ground coffee beans. The heat and pressure extract all of the soluble oils and flavors from the ground coffee beans. The required pressure to do a good extraction is between 8-9 bars of pressure, which real espresso machines are capable of producing thanks the their powerful pumps. But a steam driven machine relies on pressure created when the water is heated in it’s boiler, producing steam, which pushes the water through the ground coffee. The pressure created by the steam reaches only 1-4 bars, which is insufficient to do a good extraction, and produce the thick golden crema that is the distinction of an authentic espresso shot. That being said, the Kalorik EXP25022 functions much like a real espresso machine but it lacks the pressure to create a real crema-capped espresso shot. It does, however, make a darn good cup of robust coffee, and for many reviewers and buyers of this machine that is all they are looking for. For additional fun and enjoyment, the Kalorik EXP25022 machine includes a swivel jet frother so that you can make cappuccinos, latte, and more with a frothy-milk finish, just like what’s served at your favorite coffeehouse. And it did get a top rating from the folks at Good Housekeeping. You can have fun with the Kalorik EXP25022 and make great tasting coffee drinks! Best Budget Semi-Automatic Espresso Machine – Espresso machine under $100! Best for those on a tight budget. The DeLonghi EC155 Espresso Machine provides irrefutable evidence that you can make a great cup of espresso with a machine that costs less than $100. Hard to believe, but true. The secret to the delicious tasting, créma-topped espresso that this machine makes is that it uses a pump, and not steam, to force heated water under pressure through the ground coffee. This is the same method, and makes espresso at the same level of pressure, as that employed by espresso machines that cost 10 times as much. The DeLonghi EC155 is a semi-automatic espresso machine. This means that the user must control certain aspects of the brewing process. But that allows the user to adjust and control the strength and flavor of their espresso. Customized in other words. The DeLonghi EC155 espresso machine doesn’t have a long list of bells and whistles like a fully automatic espresso machine have. But that’s OK. 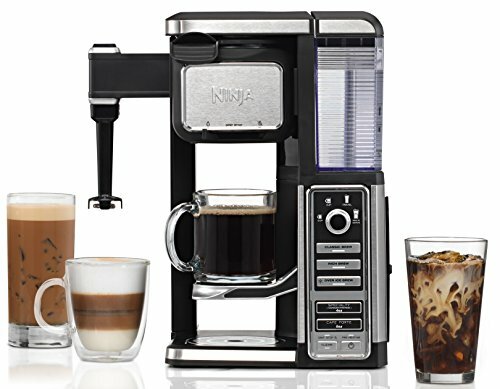 It has all of the essential features necessary to make a tasty espresso, cappuccino, or latte. And you wouldn’t expect a lot of fancy features on a machine costing less than $100. If it did I would be very suspect. Easy-to-use Controls – A simple dial on the front features 5 different settings. Designed and Engineered in Italy – Where espresso originated! Best Value Semi-Automatic Espresso Machine – Great value and best buy for first entry level home espresso machine if you have the budget. Most espresso machine retailers will tell you that the Gaggia Classic espresso machine is one of their all-time best sellers. That’s because this machine is so well-built and delivers such a good cup of espresso that it has a great following and a great reputation. This machine was designed and built by Gaggia S.p.A. in Milan Italy. Gaggia is without question one of the most respected makers of espresso and coffee machines in the world. The Gaggia Classic is made exclusively in Milan, Italy, by Italian craftsmen and craftswomen. If you are looking to purchase your first home espresso machine this is a great choice. It is modestly priced, it is easy to set up and easy to use. It cleans easily and the brushed stainless steel finish looks great in the kitchen. But best of all, and most importantly, it makes a delicious espresso drink topped by a thick, rich créma. The popularity of this machine is due in part to it’s durable construction and the inclusion of many commercial grade machine features. For starters the Gaggia Classic’s portafilters and grouphead are made of heavy-duty marine-grade brass with chrome plating which help stabilize the water temperature during the brewing process. The filter basket measures 58 mm in diameter like on commercial espresso makers. Its commercial-grade construction includes stainless-steel housing, a powerful17 bar pump, and a quick-heat boiler. One more commercial-grade feature is a three-way solenoid valve which allows immediate pressure release from the grouphead once an espresso shot has been completed which allows the portafilter to be removed and the next shot to be prepared without having to wait. The Gaggia Classic also works extremely well with ESE coffee pods and is designed to make two espresso shots at the same time. Best Semi-Automatic Espresso Machine – The best semi-auto espresso machine that can easily outperform Starbucks. There are plenty of people who are not able to make it through the day without having at least one mug of coffee. It really is tasty, makes you more alert and gives you a veritable spring in your step. Certain people are satisfied with instant coffee, other people can take pleasure in a cup of filter coffee, yet increasingly more individuals are looking for the stronger and much more fragrant flavor of homemade espresso. The most popular home espresso machine in the mid-range price ($300-$800) is definitely the Rancilio Silvia espresso machine, which is the best selling product above $300. This is a smart looking stainless steel appliance that weighs in at about thirty pounds and is relatively streamlined in size, which means it should fit on most kitchen countertops without having any kind of space problems. It operates with both pre-ground coffee purchased from the store or your nearby coffee shop, or you can grind the beans at your home for the freshest coffee possible. Many people don’t realize that coffee really starts to go stale soon after it has been ground, which is the reason why it needs to be kept in an airtight container. If not placed in a sealed container it will likely be stale within 1-2 hours, but even if sealed the coffee will start to gradually deteriorate. To get the freshest coffee, you truly do need to grind your own coffee beans. The Rancilio Silvia espresso machine is very straightforward to set up and has a very clear and helpful instruction guide supplied. As soon as you have filled the detachable reservoir with water up to the maximum line, you’ll be able to turn it on and it really should warm up in about half an hour ready for use. Making perfect espresso is actually a fine art, which is why coffee outlets utilize very trained baristas to provide you with your coffee fix. It is necessary to be sure you’ve measured the appropriate amount of ground espresso into the filter, either double or single depending on the strength desired, and then tamp down solidly with close to 30 pounds of pressure. Dimensions: 13.25? x 11.25? x 9.25? In order to check out how difficult this actually is, it is a good notion to press down on a set of scales a couple of times, to begin with until you get it right. The tamper supplied with this equipment is not perfect as it’s lightweight and made of plastic, so it can be advisable to purchase a metal one if available. 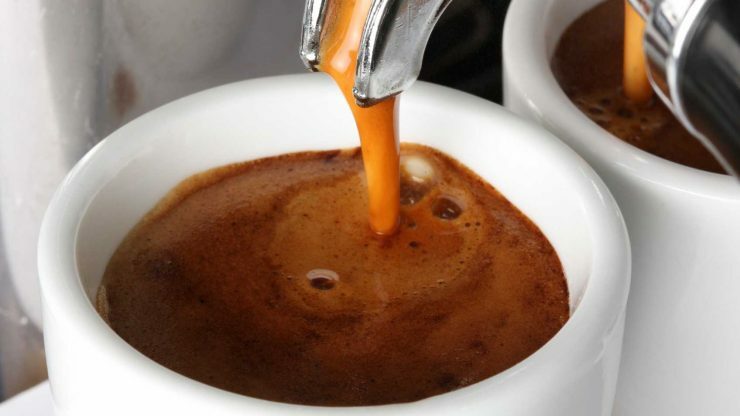 This will help you to obtain a rich and silky smooth crema on top of your espresso. This unit additionally has an outstanding steam wand if it’s milky coffees, including lattes and cappuccinos that you favor. It truly is very easy to produce smooth and bubble free steamed milk. 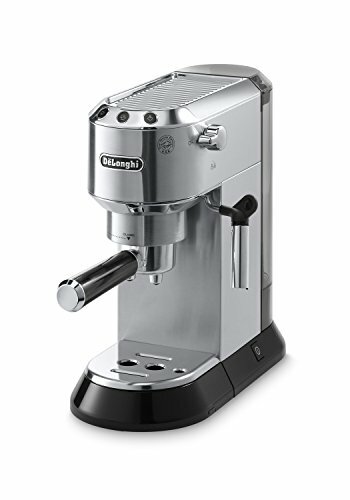 One of the reasons that the Rancilio Silvia espresso machine is so well-liked, apart from its simple, classic design and not overly expensive price tag, maybe the fact that it’s one of the easiest espresso machines to utilize, which means that anybody can enjoy tasty espresso-based drinks at home. Best Budget Super Automatic Espresso Machine – Best for those on a tight budget and still want a super automatic. Add together its elegant looks, an impressively long features list, push-button ease-of-operation, low maintenance, and the excellent “I must be in Italy…” quality of espresso that this machine produces, and you end up with a brilliantly awesome espresso machine. The menus are easy to navigate thanks to an electric blue LCD display. Push-button simplicity begins with seven programmable buttons which operate many of the features on the machine including five temperature settings, three coffee volume settings, pre-infusion, a pre-grinding feature, and an on/off timer and clock. A sleek stainless steel front panel and steel outer shell house the Titanium’s stainless steel lined brewing boiler and additional steaming boiler. This double-boiler system is designed to create steam for heating and frothing milk without the typical wait time after you have finished brewing your coffee. And the Gaggia Titanium gives you the option of using either the stainless steel Gaggia Turbo Frother or the auto-frother (which is included) to make supremely delicious cappuccinos and lattes. Customizing your espresso or coffee drinks is absolute simplicity. Firstly you can select from three brewing button options to dispense the exact amount of coffee that you’d like. If you want to adjust the grind of the beans, somewhere between very fine and somewhat coarse, then all you have to do is open the Titanium’s 8.5 oz bean hopper to and choose between 18 individual grind settings. While you’re there in the bean hopper (did I mention that the hopper holds up to 8.5 ounces of your favorite coffee beans?) you’ll see where you can make the adjustment to deliver between 6 and 9 grams of coffee for each shot. And since it seems that everybody likes their coffee just a little different you can easily change any of these settings whenever you need to, and then change back again! And if for some reason you find yourself in the mood for something a little different than the whole bean coffee you keep in the machine, like decaf (really? ), you can easily add pre-ground coffee to the Titanium’s bypass doser and brew away! Whenever the espresso machine needs more water or beans, or even when it needs to be cleaned, a helpful message appears on the LCD display, alerting you to do so. And a feature that you will love is the Titanium’s swivel base, giving you easy access to the 60 ounce removable water reservoir, the used grounds dump box, the drip tray, and internal brew group for the simplest cleaning and maintenance possible, without having to lift and move the machine! A menu button in the control panel offers one touch access that makes it easy to program auto turn-on and shut-off, set pre-grinding and pre-brewing options, and change the display language among several other options. The RapidSteam technology allows you to instantly go from brewing to steaming, and back again, without the re-heat wait time associated with single boiler systems. You’ll be making cappuccinos and lattes faster than any drip machine could ever make a simple cup of coffee. The push button technology allows you to simply press the brew button and the machine will automatically grind and extract the coffee to your desired taste. And when the coffee is finished brewing it will place the coffee grounds into the internal dump box for later disposal. The LCD display will tell you when to add beans, add water, if the brew group is out of place and even when to de-calcify the machine. You will also use the LCD display technology for system programming that includes temperature control, auto shut-off, pre-infusion, pre-grinding, and cup warmer. You have total control over coffee strength and flavor at the push of a button with the Gaggia Titanium’s adjustable doser, which controls the amount of ground coffee used for each drink (between 6 and 9 grams for a single shot). Have your coffee at the temperature you prefer. The Titanium features five different temperature settings for maximum control. Coffee pre-infusion is the first step to a great espresso coffee drink. As part of the brewing process the Titanium first moistens and conditions the ground coffee in a two second process. Another two second pause allows the ground coffee’s aromatic oils to leach from the interior of the coffee before brewing begins. The professional conical burr grinder has 18 settings allowing you to grind from fine to coarse to accommodate light, medium or dark, espresso or regular coffee beans. Preheating your coffee cups is important so the Titanium features a cup warmer that will hold up to six espresso cups and is actively heated. When the machine is on, the cup warmer will be on. The Titanium comes equipped with a new stainless steel Turbo-Frother frothing wand. It also comes with an automatic frothing attachment which will drop pre-frothed milk directly into your cup. The large removable reservoir holds 60 ounces of water which is enough for approximately 30 espressos or 10 cups of coffee. The Gaggia brew group, which is the internal part that brews the coffee is easy to remove and clean. Just open the front panel and remove with the thumb release lever. Simple maintenance would include a quick rinse and dry. The bean hopper holds 8.5 oz of fresh whole bean coffee which is enough for approximately 30 espressos before refilling. There is a removable dump box located inside the machine which is easily accessed from the front by sliding out the drip tray. The digital display will indicate when the tray or the dump box need to be emptied. Best Value Super Automatic Espresso Machine – A good value and the best machine for cappuccino lovers. After you’ve tasted the rich, complex, crema-topped espresso that the DeLonghi Magnifica ESAM 3300 Super Automatic Espresso Machine makes, you realize that you’ll never be able to enjoy drip coffee anymore. 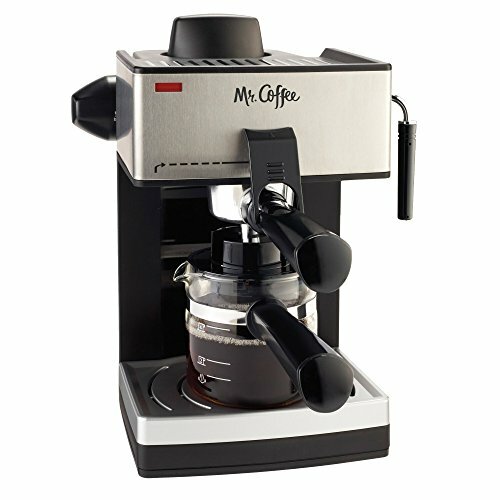 You may have a sudden, and justifiable, urge to throw out the Mr. Coffee that you got at Target, but don’t worry, because it has never been easier to make a perfect espresso (or cappuccino or latte) at home. Not since the innovation of these super easy, super awesome, super automatic espresso machines. If you can push a button, then you can make a perfect espresso! The DeLonghi Magnifica ESAM 3300 is a handsome and sleek looking coffee machine, and will add class to any kitchen. Designed and manufactured in Italy, the same country that gives us Maserati sports cars and Prada shoes. And wasn’t it the Italians who invented espresso? As an espresso aficionado you know that the best tasting coffee drinks are the result of using only freshly ground coffee beans. This is the reason why the DeLonghi Magnifica ESAM 3300 Super Automatic Espresso Machine automatically grinds the coffee beans only just prior to brewing, resulting in the very freshest, most aromatic coffee, and best tasting espresso. This unique and patented system is called the Beans-to-Brew System. 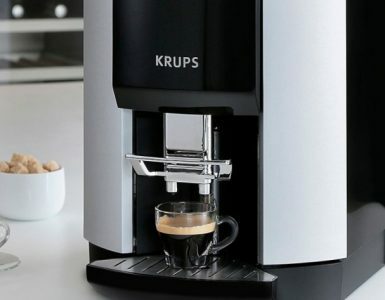 Whether you’re making yourself an espresso to get your day started, or making cappuccinos for friends after dinner, the Magnifica is up to the task. The DeLonghi Magnifica ESAM 3300 makes it simple and quick to prepare mouth-watering espressos, cappuccinos, lattes, macchiattos, lattes, and Café Americanos. The DeLonghi Magnifica makes brewing an espresso as easy as pushing a button. All of the controls are easily accessible and are found on the front panel of the machine. There a four buttons. These include an on-off button, a single cup button, a double cup button, and a hot water button. You will also find two adjustment dials on the front panel. One of the dials adjusts the amount of water used per brew cycle, and the other dial adjusts the amount of ground coffee used per brew cycle. The variations of settings allows you to control and tweak the coffee strength and flavor to your own personal taste. You can also specify the size of drink, from an espresso shot with 1 oz or less of water, to a café créma up to 6 oz. (for example). The DeLonghi Magnifica ESAM 3300 features a double boiler system using stainless steel-lined boilers, the type found on professional machines. The stainless steel double boilers are extremely durable, they heat water faster, and they are very easy to clean. But the greatest advantage of a double boiler system is that it allows you to begin steaming milk (for a cappuccino, for example) immediately after the brew cycle has finished, without waiting for the boiler to reheat more water. In addition to being good looking, the DeLonghi Magnifica ESAM 3300 is also a muscle machine. It can produce up to 15 bars of pressure. It brews espresso, however, at 8-9 bars, which is the ideal pressure for perfectly delicious espressos. The machine features an attached water reservoir which includes a water level indicator so you know when it’s time to add water. The easily removable 60 oz reservoir is very easy to refill. Just slide out the reservoir and take it to the sink. With 60 ounces of water, you can make plenty of 1-ounce espresso shots before refilling. There is also a bean hopper built right into the DeLonghi Magnifica ESAM 3300. It’s easy to load! You can put as much as 7 ounces of your favorite roasted coffee beans into the hopper and you’re all set to make some tasty espresso drinks. When you select a brew option the machine automatically grinds the beans, right before brewing begins. This results in the freshest, most delicious coffee drinks. DeLonghi has patented this Bean-to-Brew System. When grinding coffee beans for espresso you want to use professional quality, a conical burr grinder. This is absolutely the best type of grinder, and produces the most consistent grind. And guess what? There’s one built right into the DeLonghi Magnifica ESAM 3300. You can select from 7 different adjustment settings. Different grinds will change the strength and flavor of the espresso, so you can choose the grind that suits your tastes best. Regardless of which grind you choose you will always have plenty of grinding power. Another secret to creating the richest most flavorful espresso drinks is to moisten the coffee grounds slightly just prior to brewing. This is called “pre-infusion and it helps release the ground coffee beans soluble oils resulting in the most flavor and aroma. And of course, the DeLonghi Magnifica ESAM 3300 features a pre-infusion cycle. A 2-step pre-infusion cycle. What happens if the bean hopper is full of your favorite beans and someone wants their latte de-caf? Do you turn the machine upside down and dump all the beans out? Thankfully, No. The DeLonghi Magnifica ESAM 3300 has a feature called a “bypass doser”. This smart feature allows you to place pre-ground coffee directly into the brew group for brewing instead of grinding the beans in the hopper. The DeLonghi Magnifica ESAM 3300 features a patented cappuccino system which uses a special chamber that combines the steam and the milk to create a rich, creamy foam for your cappuccinos, or froth for your lattes. The cappuccino system rotates 180 degrees which permit you to use any size milk container. You won’t have to wait around for the machine to reheat before you can brew your next shot. This is thanks to the “instant re-heat function” which heats the core of the machine. This keeps the machine at the perfect temperature for brewing even if several minutes pass between brew cycles. If you want the best tasting espresso you have to brew into a warm cup. Period. So you gotta have a cup warmer, and the Magnifica does. After brewing a shot of espresso the Magnifica automatically rinses the brew group. This is great because it’s important to keep your machine clean for optimal performance. The Magnifica has an internal dump box where used grinds are placed after brewing. It’s also removable, and guess what? That makes it easy to clean! I love this — the DeLonghi Magnifica is the only machine that allows you to fill the water reservoir and empty the dump box without moving the machine. Cool. Remember, regular cleaning and maintenance prolongs the life of your machine. The DeLonghi Magnifica ESAM 3300 features the smallest removable brewing group system. Because it’s removable you can get to areas which are normally difficult to reach and so can be cleaned easily. Another “easy-to-clean” feature: a removable drip tray. Easy to remove, easy to rinse, easy to put back in place. When it’s time to descale, the machine will let you know! It is recommended that you descale the boilers every 2 months to remove all mineral deposits. Descaling is easy and the process is explained in the user’s manual. If you forget to turn off the machine after use, which I do frequently, the “Automatic Shut-Off” will prove to be a real energy saver. When you buy an espresso machine you want to buy from a company that will continue to stand behind their product. DeLonghi has a program called “White Glove Service”. These folks really know how to deliver. The White Glove Service is reserved for Magnifica customers. The helpline is staffed by people who really know the ins and outs of this machine. And if you ever need to ship your machine back for repairs they pick up the shipping cost. As a true espresso aficionado who truly appreciates espresso for exactly what it is then you know that an espresso machine is a worthy self-indulgence that will make you happy for many, many years to come. It is also a classy and awesome addition to your kitchen. It is handsome and stylish. It makes a statement. And the espresso drinks that you’ll become an expert at making will be enjoyed by all of your friends and family, and they will recognize your style and sophistication. You will love being able to make your own espressos, lattes, and cappuccinos whenever you desire, and you’ll be saving a small fortune over what you used to pay at your local coffee house. If you appreciate all the nuances of a great cup of coffee then you deserve to splurge on yourself, because a good espresso is one of life’s simple pleasures. Best Super Automatic Espresso Machine – Press a few buttons and you’ll have a great espresso! You don’t have to go to Italy to get an authentic espresso or cappuccino. All you need is an authentic Italian espresso machine, like the Gaggia Platinum Vision! Gaggia S.p.A. is an Italian manufacturer of espresso machines designed to be used in the home, like the Gaggia Platinum Vision Espresso Machine, and its brand is synonymous with quality and dependability all over the world. It began in 1948, when Achille Gaggia, the man who is credited with the worldwide popularity of espresso coffee, filed a patent on a machine which eventually evolved into the modern espresso machines that we know today. Gaggia’s first espresso machine created specifically for home use was called the Baby Gaggia, which to this day is still regarded in Italy as being the perfect family coffee-maker. All of Gaggia’s espresso machines are still, to the present day, produced in the Robecco Sul Naviglio factory in Milan, Italy, the place where tradition and care for details merge with state-of-the-art engineering. It’s never been more convenient to brew a superb shot of espresso. The Gaggia system provides just the right amount of power behind each shot of espresso. Though you probably would not need it, the Gaggia Platinum Vision Espresso Machine can provide up to 15 bars of pressure. Another brilliant design element (you will soon recognize the value of) is the rapid steam boiler system. This system allows you to change immediately between brewing and steaming with no waiting around for lengthy re-heating times. What this means is a superior espresso, cappuccino, or latte, at the ideal temperature. A superb cup of coffee always starts with freshly ground beans, and the Gaggia Platinum Vision Espresso Machine grinds fresh beans with every new brew. Brewing a fresh cup of coffee is as simple as pressing an icon on the machines touchscreen display. You can choose from three icons, appearing as cups, which when pressed will brew either a small espresso, a medium, or a large coffee. If you’re brewing two cups then all you have to do is press the button two times and the machine will calculate and grind the exact measure of coffee beans, and brew two perfect cups of your chosen coffee drink. The ceramic burr grinder quietly produces a uniform, no-static grind. And you may even adjust the grind setting between coarse, medium, and fine by using the included grinder adjustment tool. Just insert as much as 8.8 ounces of your favorite beans into the seal-able coffee bean hopper. It’s an easy task to keep track of the number of beans remaining since the bean hopper is see-through; additionally the machine will alert you using a “add coffee beans” message whenever the hopper runs low. It can’t get much easier! Does your better half like their cappuccino just a little more robust than you do? A dial situated on the coffee dispenser allows you to adjust the body and intensity of each drink, even while it’s brewing. Leave the dial directed to the middle for a regular strength drink, but turn it to the left to get a more mild brew or to the right for a more robust one. A coffee house won’t give you any fine-tuning options, but the Gaggia Platinum Vision Espresso machine does. You can actually customize the amount of espresso per shot from 7 – 10.5 grams by pressing the icon of the coffee drink you wish to adjust for two seconds, then select the quantity of coffee to be ground. When preparing a cup of coffee your cup is placed on a drip tray that can be adjusted for height according to how large or small your coffee cups are. A push of a button will electronically adjust the height of the drip tray for you. Always empty and thoroughly clean the cup tray daily with warm water. The Gaggia Platinum Vision Espresso Machine features a built-in cup warmer. Why? Mainly because brewing into a cold cup will quickly lower the temperature of your brew and you won’t get the optimal crema. Not good. The Gaggia Platinum Vision’s frothing wand swivels outwards, so you can froth milk like a pro. The Pannarello attachment allows you to steam and froth milk every bit as good as the young lady behind the counter at Starbucks. To steam, press the steam icon on the touch screen. This takes you to the steam/hot water sub-menu. Look for the word “steam” on the touch screen and press it, then turn the steam knob on the left side of the machine. Get Ready! Steam and froth your milk and get ready to make a perfect latte! The Gaggia Milk Island was created to easily connect to the Gaggia Platinum Vision machine to make it that much easier to foam and steam milk for a superb latte or cappuccino. Turn the steam knob that you will find on the side of your machine to the “milk island” setting and the machine conveniently foams and steams your milk. Wouldn’t it be nice to just wake up, head into your kitchen, press a couple of buttons, and in mere minutes be savoring a fresh, steaming hot latte, that cost you just pennies? What if you never had to reluctantly wait in line yet again for your morning eye-opener? No more tips! Just a great cup of coffee. And if you truly think you’ll miss Starbucks you can use Starbucks coffee beans – We do. If you focus on these major product features you will be able to choose a very good machine. Beware that you may find “inexpensive” machines that appear to offer the same features as a more expensive machine. In the end, these machines turn out to be of much lesser quality and are problematic. No machine is perfect, but my recommended machines will include many, if not all of the above features. If you decide to get a semi-automatic espresso machine, then you will need to purchase a coffee bean grinder. Bean grinders aren’t built into the semi-automatic machines like they are with super automatic espresso machines. Check out my recommendations of best coffee grinders from the list below if you need a coffee grinder too. Don’t scrimp when it comes time to buy a coffee grinder. One of the secrets to creating a great espresso is to have a good grinder. Poorly ground coffee beans will not produce the same taste of a Starbucks espresso shot, and the shots may taste excessively bitter. Very typically the problem is we haven’t used a good quality bean grinder. And pre-ground coffee, although it will work, will never taste as good as fresh grinding your own coffee beans using a good quality coffee bean coffee grinder. If you want to make great espresso shots then start with a great grinder! Kalorik EXP25022 – Best steam-driven espresso machine. Very cheap and makes a reasonable coffee close to real espresso. 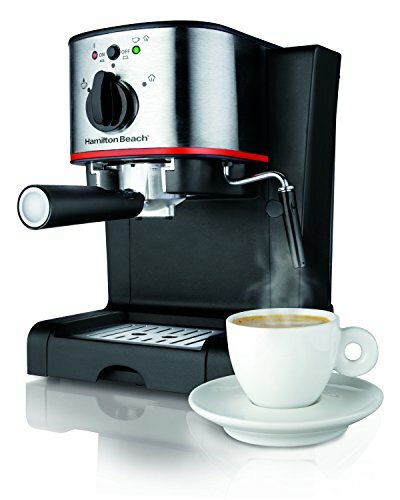 DeLonghi EC155 – Best for those on a limited budget but who desire a decent and authentic espresso. Gaggia Platinum Vision – Best super automatic espresso machine. Press a few buttons and give it a minute. Great espresso. DeLonghi ESAM3300 – Ideal for cappuccino lovers. Great value for a super automatic espresso machine! Gaggia Titanium – A fine super automatic espresso machine for the smaller budget. If you need ice for your iced espresso or espresso milkshake then you can use one of these countertop ice makers. Delonghi ec155 Mr. Coffee Ecm 160 Brevilles 870 is the best espresso Machine of 2016. These machine is good for home and office.